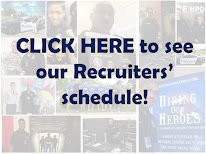 Houston Police Department: Small or Tall, Answer the Call! 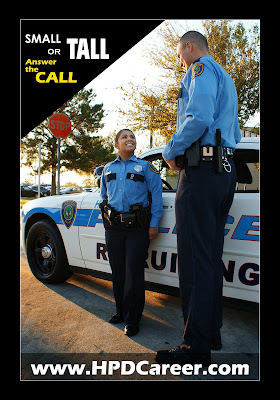 Small or Tall, Answer the Call! People always ask me am I too small, am I strong enough, can I really do this? 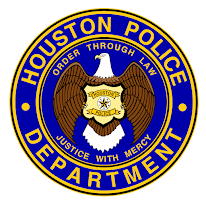 After six months in the Houston police academy, you will be the best trained police officer in the country. Size does not matter, you will have the confidence and skill to handle any situation. Don't forget, we all have your back in the time of need. Don't mess with our gang, we are the biggest gang in town. The good gang. Heroes don't always wear capes you know. Haha, this is a great pic of these two newly minted PPO's! I remember attending police training in New Jersey and receiving OC training (oleoresin capsicum is the fancy way of saying pepper spray)... We had to go through a course with the spray in our eyes and at the end do a takedown. The first guy out was 6'4 and held on to the doorframe, crying, and refused to move. The last girl out, 5'2 threw the non-compliant "suspect" over her shoulder. That was one day I first learned that good training and strong positive attitude can surpass any physical challenges. I've finished all of the steps in the process and look forward to the next class.